Cut ribs into 4 portions. 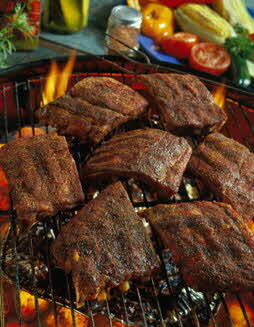 Place ribs in shallow dish. In small bowl, combine brown sugar, paprika, onion powder, celery salt, cumin and black pepper; rub evenly over meaty side of ribs. Cover with plastic wrap and marinate in the refrigerator for 4 to 24 hours. At least 1 hour before grilling, soak wood chips in enough water to cover. Drain before using. In charcoal grill with a cover, place preheated coals around a drip pan for medium indirect heat. Add 1/2-inch hot water to drip pan.